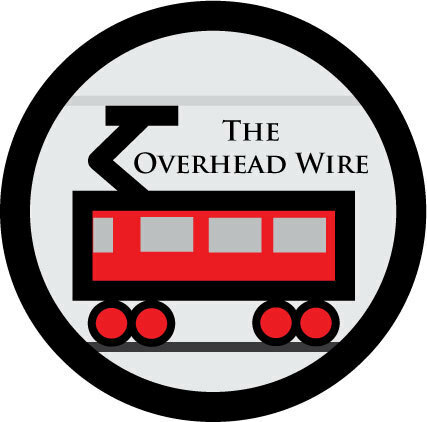 The Overhead Wire: The First Electric Railway? While Richmond VA is still the first electric transit system proved in 1888 by Frank J Sprague, apparently Montgomery Alabama was the city with the distinction of the first electric streetcar line in 1886. Or was it? The often unsung electrician was Charles Van Depoele and he opened 11 electric railway lines before Sprague opened his network in Richmond. The first being a demonstration line in Chicago in 1883. However these systems were prone to breakdowns and were often in need of fixing. Another electrician, Leo Daft, had built electric lines on Pico in LA and in New Jersey, only to have issues with trollers coming off the wires and reliability. It wasn't until Frank J Sprague that systems were finally reliable enough and the invention of the spring loaded trolley pole (with the help of Van Depoele's first troller idea) kept the wire and trolley in constant contact. However Mr. Sprague recognized himself that the first regularly operating trolley line was Mr. Daft's in Hamden Line in Baltimore, constructed in 1885. Mr. Sprague himself opened a line in St. Joseph Missouri in 1887 but proved himself when he electrified and ran 40 cars in Richmond VA in 1888. He also proved to investors that the vehicles would still work when they were backed up end to end, all pulling electricity from the same wire. He shouldn't get all the credit since there were many that came before him, but he's often credited with being the father of electric transit. So which was the first? Are we going by reliability? By first operating date? By demonstration? I would say they all win since they all contributed to the cause. It's just unfortunate that they haven't gotten the recognition they deserve for their contributions. Ernst Werner von Siemens had developed an early trolley bus in 1882, though in 1879 he had an early electric locomotive. A demonstration electric streetcar line opened in Windsor, Ontario in 1886, but closed the same year Frank Sprague opened his line in Richmond which receives the distinction. The following year (1887), another Ontario city, St. Catharines, opened its first streetcar line, the first in Canada. You mean Montgomery, Alabama. You had me all excited that my hometown had a transit distinction... Birmingham never gets a break. Man I keep messing up on places. Maybe I should stop posting so late. Thanks for the catch Patrick. "Canada's first electric railway, Strachan Ave to Dufferin St, Toronto, Ontario, 1884, fare 5 cents"
Actually was a demonstration at the Canadian National Exhbition. First year used side power rail, followed in subsequent years by an overhead trolley. There are many other possible candidates for the honour of "the first electric railway". Werner von Siemens built his first electric tram line in the south of Berlin in 1881, but it closed when Hitler was in power. Reportedly, the oldest continuously operating electric railway currently is Volk's Electric Railway in Brighton, England. This opened in the 1880s, and it did before Richmond. These two I mentioned are both narrow gauge. Yup. The key system is credited with inventing the diamond pantograph. My favorite story about the Richmond electric railway was about the night one of Mr. Sprague's pioneer cars developed motor trouble, and he instructed an assistant to go to the barn an bring the "special instruments", which weren't technical apparatus at all, but were a team of four sturdy mules! (one of my father's uncles was one of the last of the old time muleskinners, so hybrid equines have a special place in our family history). Here is Southern California, the first electric railway ran on Pico Blvd, from downtown to the Electric Railway Homestead Tract (one of the earliest of many real-estate oriented trolley lines). The man who got me started in electric railway preservation lived in this neighborhood, and thought it was "really cool" when he found the name in some old documents pertaining to his home. Baltimore had an operational third rail electric railway in 1885.